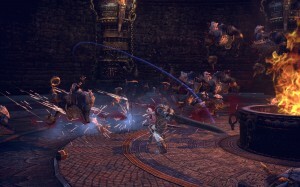 TERA Online has been popping up on my radar for a while now. Last night I gave in and pre-ordered, which gives me participation right in all coming betas. I am currently downloading the client, which might take a while. Last time I checked I had 10% completion and the system told me, it would take 14 hours more. The download speed was suspiciously low when compared to my max bandwidth, which tells me that not to many people are participating in the torrent, yet. That might change overnight or toward the weekend. The second beta test weekend is scheduled from Friday, Feb, 24th, 3pm EST to Monday, Feb, 27th, 3am EST. There will be a level cap at level 27 and a limited number of character slots. The later is usually a problem for me in betas, the level cap never. I tend to go and check out multiple races and classes until I find one I can stick with for a while. Not that my pick is ever finalized. What am I going to look out for? Of course the combat style. Getting close to the opponent and then pushing attack won’t be good enough anymore. The interface will expect you to position yourself and to aim for your target. I’ve gotten a taste of that play style in Fallen Earth already and would love to see how it plays out here. 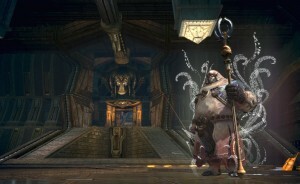 Race and Class selection seems typical for games originating in Korea and Japan. I will probably start out with a Slayer, since most of the time I end up playing melee DPS. Second choice will be an Archer or a dual wielding Warrior. I dislike dual wield classes, since I just can’t wrap my head around the idea that so many fighters now or in medieval times should be able to use two weapons as well coordinated as it seems possible in MMOs. Mystics may be my third or fourth choice, because they seem to be a pet class. Don’t ask what race I’ll choose. I have no idea, except you won’t see me playing the child like Elin. The interface is going to be a tough one. The game allows the use of game controllers and may force me to use WASD movement. Lets find out. You’ll hear some yelling and screaming if things go bad in that direction.